This speaks to a new attitude in the worker of today, while reflecting the current employment climate in this country. When such a seismic shift occurs, it is worth examining why it is happening and what implications it might possibly have for the future. We’ve discussed in the past how Millennials, more so than any generation before them, value work-life balance and flexibility. This attitude appears to be spreading to the entire workforce as a whole, as more and more people are willing to work part-time as opposed to full-time. A solid 43 percent of part-time workers surveyed have taken their position voluntarily and 54 percent saying they would leave their current full-time positions or scale back hours to work part-time if given the opportunity. This shift continues to grow, as 37 percent of current full-time respondents stated that they are now more likely to consider part-time work than in the past. This trend is telling, as 45 percent of respondents cited work-life balance as their number one priority--higher even than compensation (34 percent). Employees seem to be willing to sacrifice earnings if it means receiving a better balance of their personal and professional lives in the process. While more people are seemingly interested in working part-time, that does not mean it’s always done without reservations. In fact, 31 percent said they work part-time because it is the only option available to them. Still others cited a number of potential negative career implications associated with the move from full-time to part-time work. The loss of money (84 percent) was the top fear, followed by the loss of full-time benefits (66 percent), increased risk of being ‘let go’ (39 percent), the loss of status/credibility/prestige (26 percent), and getting ‘mommy and daddy’ tracked (10 percent). However, the fear of negative career implications do not seem to affect whether the majority of employees would ask for additional benefits. 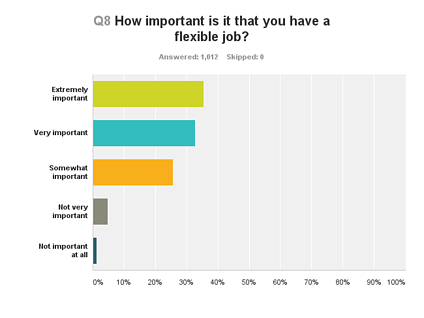 78 percent of respondents would actually feel comfortable asking for more work-life flexibility if they needed it. Amongst those who would hesitate to ask, most respondents cited that it would negatively affect their career advancement (45 percent), compensation opportunities (33 percent), or that by asking they would face judgment by their peers (24 percent). While it’s important to understand that this shift is occurring mainly due to the desire for stronger work-life balances, it’s also critical to discuss how this may affect future employment and hiring trends. The desire to shift from full-time to part-time may very well send serious reverberations throughout the business world. To adapt, businesses have to consider what they will do regarding compensation, benefits, and hiring more staff to deal with the diminished man-hours. Businesses have already begun to offer their employees benefits that appeal to this desire for more free time. In a previous survey, RecruitiFi discovered that 28 percent of Millennials say their companies have increased their focus on flexibility and work-life balance, offering options such as taking sabbaticals and the ability to work from home. That same survey found that while 38 percent of Millennials say they would like to work mostly regular work hours with some flexible working, 32 percent say they would prefer mainly flexible hours, a figure in line with the data from RecruitiFi’s latest survey. Work flexibility has long been desired, but with nearly a third of an entire generation saying they favor working this way, employers are now wisely taking note and implementing programs that cater to these desires. "Moving from full-time employment to part-time employment will trigger generous assistance with health premiums and out-of-pocket expenses that can offset much of the income lost due to reduced work hours," University of Chicago economics professor Casey Mulligan said. This is because, under the ACA, the cost of insurance will be subsidized depending on one’s income. If more companies begin to embrace part-time workers, they also may attract talented workers who were marginalized by the propensity of the business world favoring full-time opportunities. These groups include new mothers who do not wish commit to working full-time or older/retired employees who do not want to work long hours, but still have a lifetime of experience to offer. Businesses may find it harder to manage part-time employees, especially if they are working remotely, so communication needs to be stressed in order to remain as productive as possible. Additionally, part-time workers may need more time to become acclimated to a company’s culture or processes, so patience in training should always be prioritized. "Part-time workers, especially those that work more temporarily or seasonally, usually have less knowledge and familiarity with the company because they work less," Neil Kokemuller wrote in Small Business Chronicle. "Customer-driven organizations may notice less successful sales and service with part-time employees that do not become as familiar with approaches to selling and servicing the needs of the company's customers. Training can help offset these issues, but part-timers take longer to gain experience than full-time workers." With more of the workforce desiring a better work-life balance, businesses have a real decision to make. Allowing their employees to make these changes may boost their employer branding and save on overhead as discussed above. This switch will obviously not come without growing pains, so organizations that choose to implement any sort of change will need to demonstrate patience. Structural changes like this may seem daunting, but with enough guidance and leadership, businesses can come out stronger and more agile than ever before.